FILE - Former FBI Director Robert Mueller, the special counsel probing Russian interference in the 2016 election, departs Capitol Hill following a closed door meeting, June 21, 2017. President Donald Trump's legal advisers are looking into possible conflicts of interest within special counsel Robert Mueller's investigative team that they could use to discredit Mueller's inquiry into Russian election meddling, according to multiple sources and news reports. The New York Times' Friday edition reported that Trump aides were conducting wide-ranging checks into the professional and political ties of the investigators in preparation for what it described as a "looming showdown" between the president and Mueller. The Trump team is reported to be scrutinizing everything from donations to Democratic Party candidates by investors, to the personal relationship between Mueller and former FBI chief James Comey, whom Trump fired. 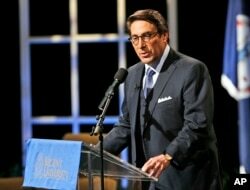 FILE: Jay Sekulow, part of President Donald Trump's outside legal team, says the lawyers "will consistently evaluate the issue of conflicts [of interest within special counsel Robert Mueller's investigative team] and raise them in the appropriate venue." A member of Trump's outside legal team, Jay Sekulow, said the lawyers "will consistently evaluate the issue of conflicts and raise them in the appropriate venue," even complaining to Mueller directly if needed. Mueller's Russia probe has assembled a team of high-powered prosecutors and experts to look into the president's financial history and examine whether any of his advisers aided the Kremlin’s campaign to disrupt last year’s presidential election. In recent weeks, Trump has expressed anger about the probe after being informed about the legal questions that he and his family could face. The Washington Post reported that Trump had told aides he was especially disturbed to learn that Mueller would be able to access several years of his tax returns. In an interview Wednesday with the Times, the president said Mueller was leading an investigation riddled with conflicts of interest, and that the special counsel should not expand the probe to include the financial dealings of his family. "I think that's a violation," Trump said. "Look, this is about Russia." George Washington University legal expert Jonathan Turley said Friday that while the Trump team's move to investigate the investigators might hold a visceral appeal, it could come at a great legal cost. "Such investigations can easily cross the line into obstruction or other charges," Turley told VOA. "It would also degrade the office of the president in reducing this controversy to the level of a bar brawl." Trump's eldest son, Donald Trump Jr., former campaign manager Paul Manafort and Jared Kushner, senior White House adviser and Trump's son-in-law, will testify next week about their meeting last year with a Russian attorney. Mueller's team has begun examining financial records and requested documents from the Internal Revenue Service related to Manafort, the Times reported, citing a senior U.S. official. The records are from a criminal tax investigation that had been opened long before Trump's campaign began. Manafort was never charged in that case. Presidential scholar Thomas Whalen of Boston University said any move by Trump to undercut Mueller's investigation would take the country closer to a constitutional crisis. "It appears obvious that Trump does not want Mueller to mess around with his personal financial affairs and that of his companies and his families that might turn up some skeletons that Trump wants hidden from the public," Whalen said. Political analyst Kyle Kondik of the University of Virginia Center for Politics cautioned, however, that legal experts indicate that the only entity that can take what amounts to legal action against a president is Congress. "Congress is controlled by Republicans, and Republicans still give Trump 80 percent approval or more," Kondik told VOA. "So things are going to have to get significantly worse for the president, in all likelihood, for Congress to take action against him." Trump appeared to be trying to shore up his team Friday, appointing Wall Street financier Anthony Scaramucci to the vacant position of White House communications director. That move may have created further chaos, however, leading to the immediate resignation of press secretary Sean Spicer, whose influence had diminished in recent weeks. Spicer tweeted that he would stay on through August. Adding to the challenges facing Trump's external team of lawyers, the team's spokesman, Mark Corallo, resigned Thursday, news reports said, citing two people familiar with his departure. Corallo was one of several people who cautioned against publicly criticizing Mueller, with whom Corallo had a close relationship. Corallo became increasingly frustrated with the operation and infighting, the sources said. One of the people said Corallo was also troubled about whether he was being given factual information about various developments.